From US Campaign member group Coalition to Stop $30 Billion to Israel. Please read and take action! PUT OUR BILLBOARDS BACK UP! 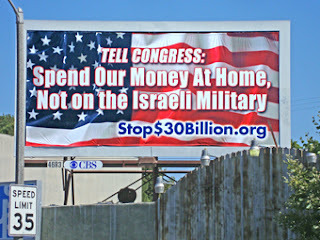 On June 11 the Coalition to Stop $30 Billion to Israel had 23 billboards erected in Los Angeles and surrounding cities with the message "Tell Congress: Spend our Money at Home, Not on the Israeli Military" over an American flag background. The billboards were contracted to run for four weeks, and we were preparing to put more up in other spots around the city. 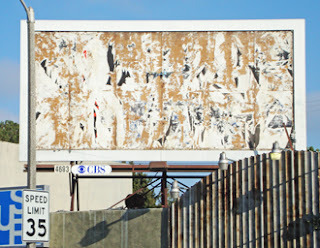 Read about our billboards here. We were thrilled. L.A. had never seen a campaign of this size devoted to this issue. That win fell apart just one week later when the billboard company--CBS Outdoor, a subsidiary of CBS Corporation-- took all our billboards down. They sent a curt email telling us they were canceling our contract and refunding our money because "your organization has used the ‘CBS Outdoor’ name without permission" in email messages and in our petition thanking CBS for putting up the billboards in the first place. Needless to say, this was a punch in the stomach. If you support us trying to get our message of ending military aid to Israel back up on billboards in the nation's second largest city, won't you help flood CBS with phone calls demanding that our billboards be put back up and our contract be honored to the full term? If there are people and organizations that disagree with our message, they have every right to buy their own billboards with a message they compose. We stand ready to debate American carte blanche support for Israel in the free marketplace of ideas. But that debate can only take place if companies like CBS Outdoor don't cave when pressured by people who claim any criticism of U.S. policy favoring Israel is anti-Semitic. Call CBS Corporation, the New York-based parent company of CBS Outdoor, at (212) 975-4321 right now. Then tell us you made the call and what if any response you got from CBS. Email us at info@stop30billion.com. Then be sure to share this Call to Action with your friends, family and colleagues via email, Facebook and Twitter. Thanks for working for justice! You may also donate via PayPal here. The Coalition to Stop $30 Billion to Israel is a 501c3 organization, so donations are fully tax deductible.